One thing every parent needs with a new baby is a good stroller. Your little one is going to be riding in style and comfort with this BeBeLove Deluxe Stroller! They say you can’t spoil a new baby, but we can sure try! This bad boy has a fully reclining seat, adjustable footrest, sunroof and food tray with a built-in cup holder. It also has an adjustable handlebar, swivel wheel lock and foot brake. And since we all know that moms don’t always have two free hands to do everything with, the BeBeLove Deluxe Stroller has a lightweight frame to make it easy for you to fold with just one hand! 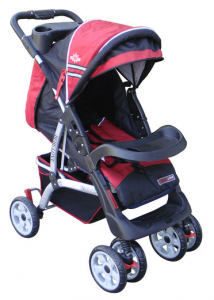 2 Southern Savers readers will win a BeBeLove Deluxe Stroller in red! Leave a comment below telling me your must-have feature on a stroller.